The Pagan custom of “Bating the Hobby Horse” takes place here on 1st May, according to Daphne du Maurier. At a minute after midnight on this date, the landlord of the Golden Lion Public House, who is responsible for keeping the ‘Black ‘Oss’ (which is constructed of canvas and wood), is awoken. The dance then begins and a Teaser bearing a club inscribed with the initial ‘O.B.’ baits the ‘Oss’. The National Trust are quite right when they describe this as a "dramatic coastline", which is why it has become a popular tourist destination in Cornwall. This hidden gem is just a few miles along the coast from Padstow, and allows you the chance to take in the stunning views and explore the buildings that now serve as the shop and café. These are a reminder of "Carnewas' industrial past when iron, copper and lead was mined from the cliffs". Underwood states that there have been reports of "grey forms" seen wandering the cliffs at night, as well as sounds that have been interpreted as the heavy boots and tools of long dead miners. 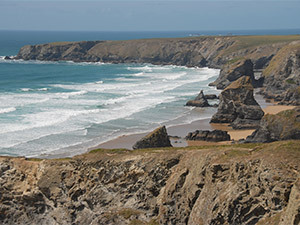 Pictured left is the Bedruthan Steps courtesy of Ericoides. For further information, please read Ghosts of Cornwall by Peter Underwood. Down the estuary there is a well rumoured to be where Jesus landed on his journey to Somerset. The well is, however, dedicated to England’s patron saint, St. George. Padstow (Cornish: Lannwedhenek) is a town and fishing port on the north coast of Cornwall, England. The town is situated on the west bank of the River Camel estuary approximately 10 miles northwest of Bodmin and 10 miles northeast of Newquay. Pictured left is a view of Padstow harbour and quayside courtesy of Mick Knapton. Licensed under CC BY-SA 3.0 via Wikimedia Commons.